With over 350 restaurants—yes, 350-plus restaurants—dining in St. Maarten can be as exotic and sumptuous an experience as you can imagine, or as simple as a flip of the hamburger or chicken-leg on the grill. From French or Italian gourmet cuisines to sizzling Caribbean dishes, from Moroccan to Indonesian; from Chinese to Indian, from Mexican to Italian; from Japanese to Surinamese cuisines, the ethnic origins of food served in St. Maarten is a true reflection of the demographics of the island’s population. You can sample some tasty barbecue ribs and/or chicken at Johnny B Under the Tree in Cole Bay, famous also for its grilled lobster, or you could choose to dine like royalty at any of the first-class restaurants along the Boardwalk in Great Bay. In fact, you may wish to start off with breakfast at one restaurant, lunch at a different one and enjoy a romantic dinner at yet another for the entire duration of your stay without repeating (unless you wish to) your visit to any one of them. The choice is yours. You can actually smell the dampness of the earth, hear the cacophony of birds chirping, as if calling out to you in various languages and catch the refraction of sunlight on some broad green leaves. And as you look down, lo and behold, before you unfolds a most breathtakingly beautiful, some would even say mesmerizing view of the island, the kind you’ll most likely not see on any postcard. You are standing, of course, at the highest point of the island—Pic Paradis (Paradise Peak) on the other side of the historic Freetown. Pic Paradis is a lush, tropical crown of rain forest, sitting majestically at the top of the Loterie Farm —a haven for hikers, bird watchers and other Nature lovers. It is accessible by motor vehicles. Green is the color of Frontstreet these sunny days, the commercial nerve center of St. Maarten, which is on its way to becoming a green zone in the environmental sense of the word. The beautification of Frontstreet includes brand new cobblestones laid throughout its length and breadth while green benches are strategically placed along it for those who want to take a short break from shopping for their favorite duty-free items. Palm trees now line the island’s busiest street from the Head of Town to the Foot of Town, and with its green public telephone booths for that quick call home, the face-lift Frontstreet has undergone is so impressive that the Lt. Governor of St. Thomas had to visit and see for himself, as news of this super make-over had reached him. The renovation of Captain Hodge’s Pier is near completion, while the second phase of the Promenade (popularly known as the Boardwalk) along the Great Bay Beach has been extended westward to the area of Sea Palace. But it is not only Frontstreet that has been virtually re-done: the entire Philipsburg area has, step by step, been spruced up. From the ultra-modern Dr. A.C. Wathey Cruise and Cargo Facility right up to the Sucker Garden Road, meandering around the new Sundial roundabout at the junction with the WG Buncamper and WJA Nisbeth roads, the roadway has been resurfaced, trees and street lights stand at attention, while tiled sidewalks allow pedestrians to stroll up and down in comfort. All of these also contribute to a freer flow of traffic. A new and free parking lot now stretches from near the Sundial roundabout to the traffic lights at the University Boulevard which leads to the University of St. Martin. It is government’s intention to extend the beautification project to all parts of the Greater Philipsburg area as an integral component of the Great Bay Improvement Plan and the Economic Development Plan. 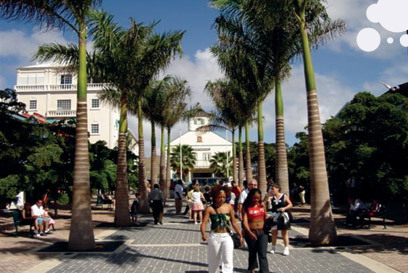 July opens with “Emancipation Day” (July 1) in St. Maarten. The flamboyant, or “July Tree” is in full blossom, with its fiery crown, resplendent in the sun, striking chords of freedom and friendliness. Then from July 21 – 23 and 28 – 30, at venues throughout the island, it is time to celebrate Summerfest 2006. From jazz to gospel music and all the genres in-between, the true hallmark of Summerfest is its all-inclusive nature. It is a musical gala buffet, pleasing to the body and soul, in an incredible atmosphere of sheer joie de vivre, which continues to attract international superstars to shine like the flamboyant tree under our “Sweet St. Martin” skies. Paul Peterson of the St. Maarten/St. Martin National Culinary Team, won the 2006 Caribbean Bartender of the Year title, the top honor for mixology at the recent “Taste of the Caribbean 2006,” held during the Caribbean Hotel Industry Conference (CHIC) 2006, at the Hyatt Regency in Miami, Florida. In the bartender segment of the competition, bartenders from the competing teams were required to prepare a variety of drinks to demonstrate their creativity, skills, personality, and showmanship. Peterson’s drink mix “St.Maartini” beat out stiff competition from 15 other Caribbean countries and territories whose national culinary teams took part in the event, dubbed the annual showcase for the development and refinement of contemporary Caribbean cuisine, presented by the Caribbean Hotel Association (CHA). The St. Maarten/St. Martin National Culinary Team also won a Gold award in the qualifying rounds of the culinary competition at which each team of chefs had to prepare a 3-course meal for 35 persons in less than 4 hours, with the menu created from a “mystery basket” of ingredients, the contents of which were not revealed until the beginning of the competition.